A Happy Election Tuesday to you. I hope you have the opportunity to go vote today, I will not here discuss my political ideas, because I do not want to start a comment war over politics (particularly I’m worried about the kind of things ‘ole Dub might say). I will, however, fully endorse the measure on the Tennessee ballot to make hunting and fishing a constitutional, personal right. Today I am taking a break from blogging about restaurant equipment and specialty coffee equipment. Today is more of a stream of consciousness type of day. I have to begrudgingly congratulate the San Francisco Giants. I like Mark Derosa, Mike Fontenot, and a couple of other Giants, so I am happy for them, but I would have preferred to see Josh Hamilton and Cliff Lee hoist the trophy. However, I am especially happy that the Yankees did not even make the World Series, thank you Rangers for guaranteeing that. I am excited about the fast-approaching end of the semester. I have two weeks left to finish a paper on which I am working regarding the apologetics of the Bekennende Kirche. This is exciting for me, because I love studying German church history. I had a meeting with a professor yesterday who has agreed to supervise me as I research and write my master’s thesis over the next 13 months. I am planning on researching German Protestants under the Third Reich, focusing on their resistance, or (in too many cases) complicity. When I tell most people about this, they either look at me like I’m a weirdo, or they say something along the lines of “So, you’ll be reading a lot of Bonhoeffer?” Dietrich Bonhoeffer is one of my heroes, but my research will be much broader than just him. 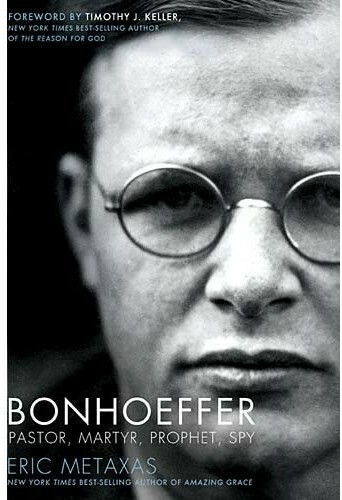 Bonhoeffer has seen a huge leap in popularity in the past decade, especially with new books like Eric Metaxas‘s biography of him. To say that he wasn’t a martyr seems to seperate God’s creation. There is no secular verse the world. It is God’s creation. The sense of not being in the world is to not be in sin. But the physical world is God’s. Was the root of why Bonhoeffer died not in the fact that he was a Christian? While Bonhoeffer’s motivations for his actions were based on Christian reasoning, the reality is that he was executed for an assassination attempt. This goes back to what the Apostle Peter said about being punished by the government for a crime committed. Not that the execution of Bonhoeffer was just, but it was legal – and politically motivated. the main aim of Bonhoeffer was not the resistance but the renewal of the German Evangelical Church (former DEK, today EKD). In Germany there are evil powers trying to turn and to fix publics gaze on Bonhoeffers resistance activity. Everybody must admit that the Third Reich is over and the EKD sill exists with her problems. It is high time to turn the gaze away from Bonhoeffers resistance activity to his activity as reformer of the Church. Assumed Bonhoeffer would be recognized as very gifted theologian and assumed his theology would be applyed the EKD had to change totally.